I love chicken parm, and this recipe from Skinnytaste was perfect! Another win for the Skinnytaste Cookbook 🙂 The whole wheat bread crumbs add great flavor, as well as all the benefits of whole grains, and since it’s baked and not fried you save a ton of calories! 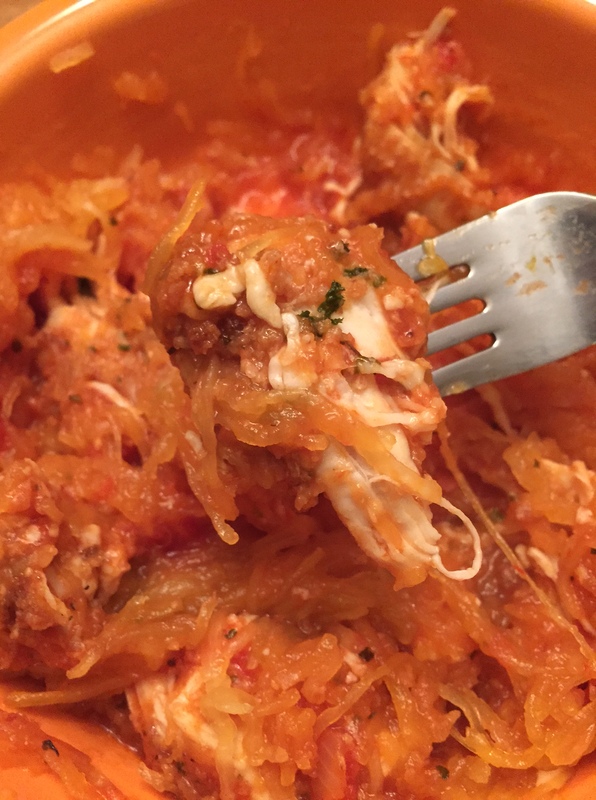 I decided to serve it with spaghetti squash to keep the calories low. Enjoy! 1.) Cook squash (see oven instructions here). I like to cook the squash a day ahead, if I have time, and let it sit in a baking dish with paper towel overnight to soak up moisture. I didn’t have time to do that this time, so I just baked the squash before cooking the chicken! 2.) Preheat oven to 450 F and spray a baking sheet. Combine the breadcrumbs and parmesan in a small bowl. In another small bowl, melt the butter, then add olive oil. 3.) Brush butter and oil on both sides of chicken tenderloins, then dredge chicken in bread crumb mixture. Put tenderloins on greased baking sheet. Lightly spray top of chicken. Bake for about 20 minutes, turning over halfway through. 4.) Heat up marinara sauce on the stove or in the microwave. 5.) For each serving, top about 2 cups spaghetti squash with 2 tenderloins. Serve with marinara and mozzarella cheese! Wow – looks like a great recipe. All ingredients are on my shopping list for next week.